Between Lower River Group in the north and Upper River Group in the south there is a remarkable gap over a distance of approximately 200 m (220 yards) regarding the appearance of thermal features, in particular larger ones. 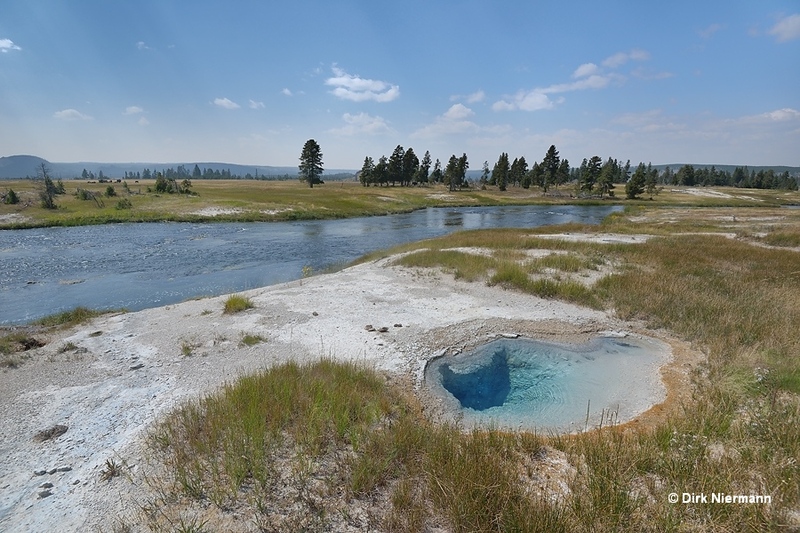 Entering the Upper River Group on the east side of Firehole River, numerous springs of all sizes show up on a belt of approximately 150 m alongside the river. Over 90 % of them are too inconspicuous to be of interest to non-scientific visitors, so only a small selection shall be presented here by photos taken on a hike in August 2015. 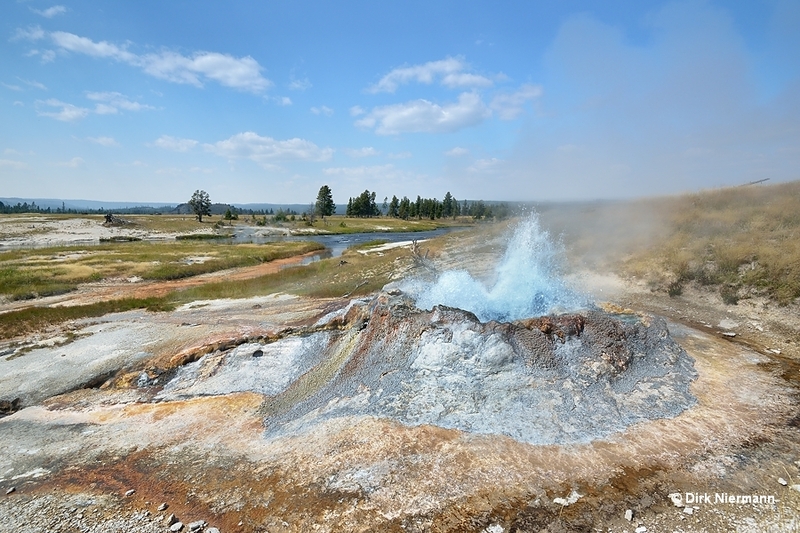 The vent of the northernmost regularly active geyser is so tiny that it is easy to miss if not just spouting. 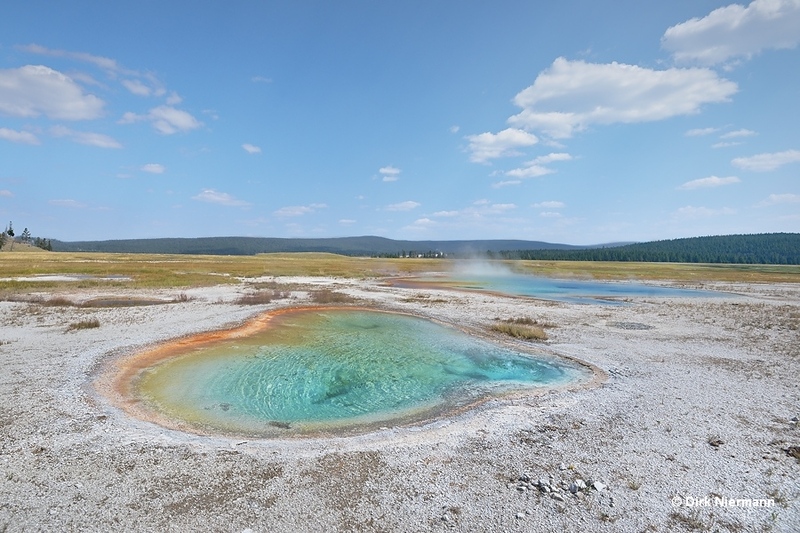 Blurble Geyser, as described by T. Scott Bryan, or Burple Geyser, as archived in the RCN database, lies within a triangle of small pools. It plays up to one foot high at an irregular interval. LRNN552 is one of the few more striking pools in this section. Concerning the size of the pool and the height of the eruptions Brain Geyser surpasses Blurble Geyser only marginally. It is to be found 25 m upstream of Blurble. Its neighbor, unofficially called "Three by Five Pool", erupts more rarely but to a height of some feet. The next remarkable feature is Dark Pool (UNNG-RVG-5, LRNN530). 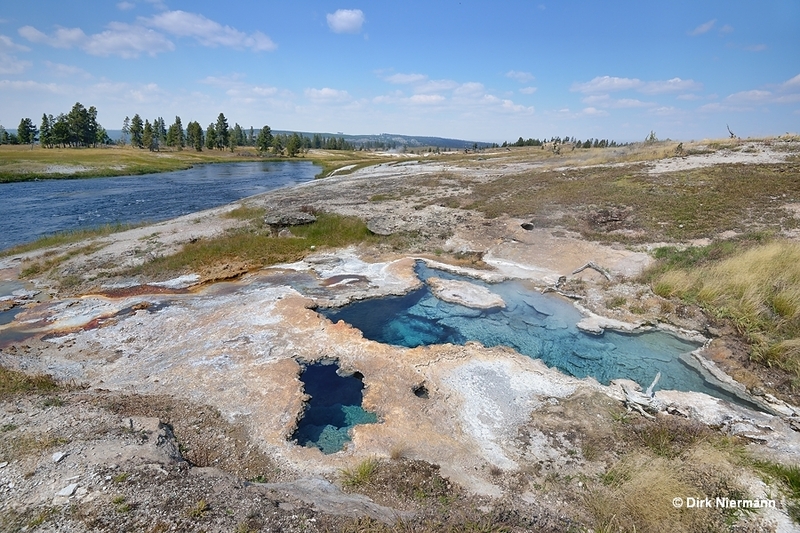 Compared to the description by T. Scott Bryan, who mentioned a "blackish-green pool", Dark Pool has heated up and shifted to a blue state. We did not see one of its infrequent eruptions reaching up to 2.5 m (8 feet). Armored Spring, a few feet south of Dark Pool, exhibits an extraordinary sinter cover with bizarrely shaped openings. The pink coloration along the sinter rim resembles of Ojo Caliente. 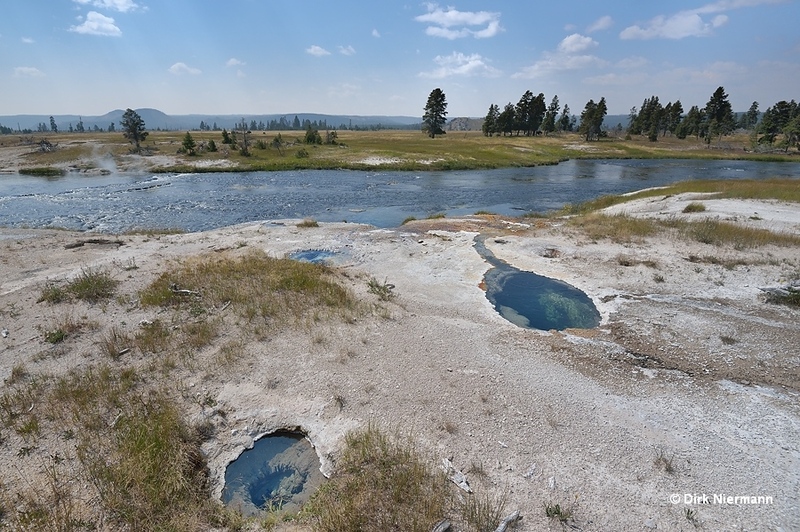 Unquestioned highlight of the Upper River Group is Fortress Geyser. It is officially called Conch Spring, but as with some other features in Yellowstone, the official name is not as catchy as the one in local usage. Fortress Geyser shows near perpetual spouting up to 3 m (9 feet) height. 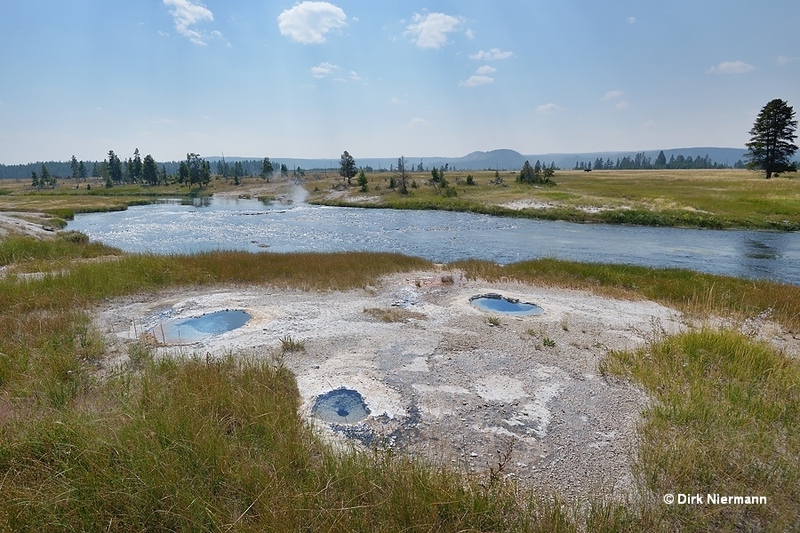 At some distance upslope of Fortress Geyser two large, shallow pools are located in an area, which is designated as UNNG-RVG-6 by T. Scott Bryan. 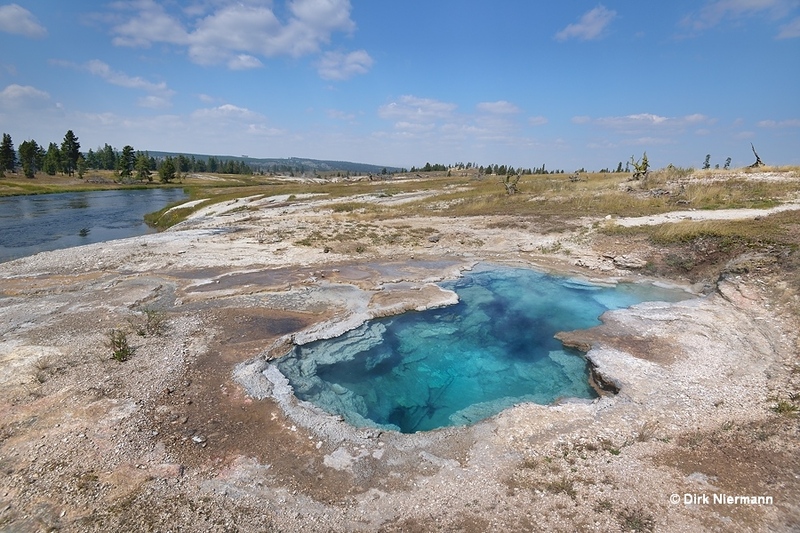 Unoffically, the northern pool is called Lightsocket Geyser because the easternmost of its three vents, which are arranged like a household light socket, is known for weak but frequent geyser activity. 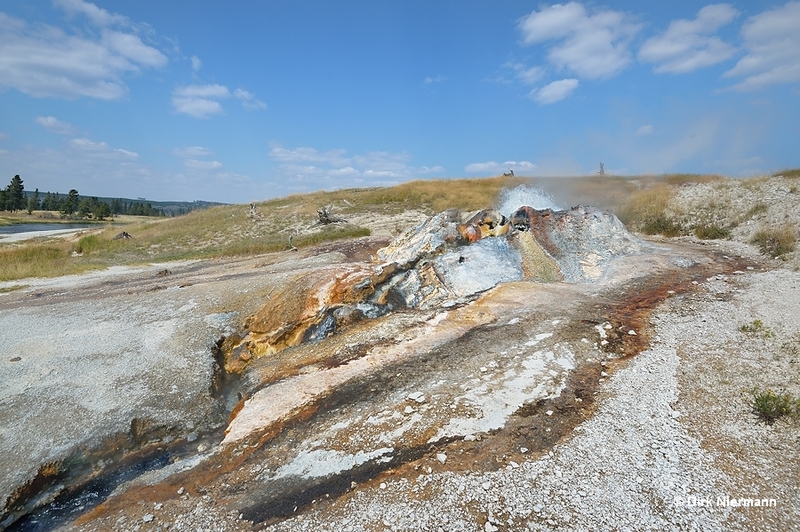 Likewise, the larger pool south of Lightsocket Geyser is unofficially named Spectrum Spring, and its northwest corner is home of a weakly spouting vent, too. But for both we were not lucky to catch any noteworthy activity.